Plug Power Inc. (Nasdaq: PLUG) stock surged nearly 10% Thursday morning after the fuel cell company posted its first ever net profit, plus announced quarterly revenue had more than doubled. Year to date, Plug Power stock is now up more than 300%. The Latham, N.Y.-based company reported second quarter earnings per share of $0.02, or $3.83 million. That was easily ahead of the ($0.14) per share, or $9.3 million loss, in the same period a year ago. The adjusted loss was $0. 04 a share, matching the FactSet consensus estimate. 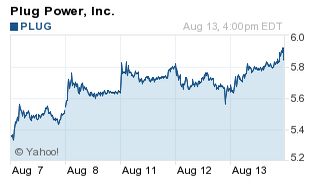 Plug Power's Q2 revenue rose 131% to $17.32 million. Analysts on average had expected $16.7 million, according to Thomson Reuters. Sales jumped to $17.3 million from last year's $7.5 million, exceeding analyst forecasts of $16.7 million. The company had cash and cash equivalents of $168.6 million and net working capital of $190.4 million on hand at the end of Q2, up from $5 million and $11.1 million at December 31, 2013. Behind Plug's strong quarter was a robust rise in demand from customers including Wal-Mart Stores Inc. (NYSE: WMT). The world's largest public company uses Plug's hydrogen fuel cells to power forklifts. Plug confirmed it deployed its first hydrogen fuel cell unit at a Wal-Mart site in the second quarter. Wal-Mart has placed orders for such units at seven sites. "Activity in the second quarter has demonstrated the value proposition of the GenKey hydrogen and fuel cell solution at customer sites, namely Walmart," said Chief Executive Andy Marsh. Additional customers including shipping giant FedEx Corp. (NYSE: FDX), and auto titans Daimler AG and BMW AG, Honda and Volkswagen, which use fuel cells to power forklifts and other material handling devices at their warehouses. Plug shipped 687 fuel-cell units in the quarter ended June 30, beating the 650 it had earlier forecast. "The Company has secured GenDrive and GenKey deals with Volkswagen, BMW, Mercedes-Benz and Honda. 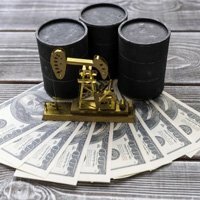 The Company expects that success within the auto-manufacturing market will open up a plethora of global opportunities as these customers standardize on hydrogen fuel cells to power the electric lift trucks at their manufacturing sites worldwide," according to Plug's earnings release. Plug Power remains extremely upbeat, saying it expects "a plethora of global opportunities" from the auto-manufacturing market as its customers begin to use hydrogen fuel cells at manufacturing sites worldwide. PLUG stock caught Money Morning's eye in January and we followed its progress through Q1 as it ignited the fuel cell sector.